It was early in the morning. The sun might have risen but its rays were yet to intensify to be felt by the people. The venue was one of the main roads of Mylapore in Chennai (Madras). It was projecting a very peculiar scenario. Small groups of women and elderly persons stood on the roadside, each group separate from the other. Women were carrying their babies; some of them were holding small boys and girls. The elderly were covering their head with towel showing part of their face only. It seemed they were waiting for someone to arrive. A few minutes passed and there appeared a gentleman. Strangely, he was wearing a stethoscope like a garland around his neck and walked straight to the groups of men and women. Smiling and caring, he addressed everyone by name and enquired their well being. Each one complained about some illness they or their children were suffering from; the gentleman listened patiently and started testing one by one with his stethoscope. Explaining what was wrong, he slipped his hand into his coat pocket and took out a box; it was full of various pills and powders, small bottles containing some mixtures. He picked up the pills and bottles and distributed to the assembled. Telling them to see him the next day, he walked past the crowd. That was Dr. M. C. Nanjunda Rao who did not mind attending to his patients even when he was on his morning walks! Unlike other physicians, he did not stop with mere prescriptions but gave suitable medicines too to his patients. He did not receive fee or charge for medicines if the patients were poor. Sometimes, he would even give some money to the deserving persons to buy nourishing food or costly medicines! Such was his compassion toward fellow humans. 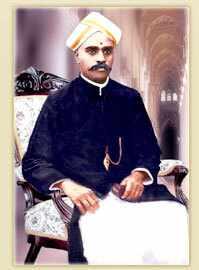 Dr. Rao was native of Nanjangud village in the erstwhile Mysore princely state. He was born in 1862 in a very humble family with very limited resources. The young Nanjunda was brilliant in his studies. That enabled him to get a scholarship from the state. After graduating from Central College at Bangalore, he wanted to join the medical college at Chennai (Madras), as healing people was his passion. The Mysore State extended financial support to him to join the medical college, appreciating his ideals. After successfully passing out from the Madras Medical College, Dr. Nanjunda Rao set up his practice in Cutchery Road, Mylapore, primarily a locality of lower and upper middle class people in Chennai. The way he treated his patients with utmost care earned him a very good name and his practice flourished soon. Unlike other allopathic physicians, Dr Rao combined the native medicines also after experiment in treating his patients. His talents earned him laurels that drew big land lords and the elite as well as Englishmen holding higher posts in the government to be his regular customers. He became the family doctor to all these people of higher strata and his income soared high very shortly. On hearing his proficiency, the king of Mysore princely state invited him to be the physician of the Palace. Dr Rao politely declined the offer saying that he would attend to the royal family and others in the palace whenever there was the need while he continued his practice at Chennai. It was Chennai that made him a physician and therefore he should pay back his gratitude to the people of Chennai, was his motto. Dr. Rao was connoisseur of arts and crafts. He took fancy in building large villas with same pattern, painted red. Thus, buildings constructed by him were identical and people would say, “Oh, this is Dr. Rao’s,” whenever they saw an aesthetically built red palatial house in the City. Dr. Nanjunda Rao was also devout and highly spiritual. He was one of the first rank disciples of Swami Vivekananda, who visited Chennai in 1893. Vivekananda was in contact with Dr Rao even when from America and on his tour of Europe, advising him about bringing out a magazine to propagate spiritual and cultural ethos of ancient India. When Vivekananda returned with active support of the West for his mission, he asked Dr. Rao to help him in establishing a mutt in Chennai in the name of his master Sri Ramakrishna Paramahamsa. 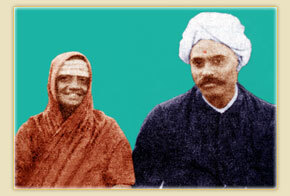 Swami Vivakananda’s disciples continued to have Dr.Rao’s association even after Swamiji’s Maha Samadhi. It was Dr. Rao who helped them substantially to establish Sri Ramakrishna Mutt in Mylapore Chennai. Once, Dr Rao had to go to Komaleeswaranpet monastery to treat a person by name Arunachalam. He was the brother of Shri Sakkarai Amma. By then Shri Sakkarai Amma had fully blossomed into a spiritually exalted soul, always experiencing the Bliss and expressing her happiness by frequent loud laughter. When enquired, people in the house told him that there was a mad woman living in the upstairs, not communicating with them but simply laughing aloud frequently and meaninglessly. Dr Rao, during his visits to Komaleeswaranpet, sometimes noticed her at the entrance of the Komaleesdwara Temple sitting on the floor and laughing at the passers by. Initially, he also took her to be a mentally deranged person. Later on, out of curiosity, he initiated communication with her and found she was really a great soul deserved to be revered and respected. He became her disciple in course of time. Though Amma was an unlettered poor Brahmin widow, Dr Rao did not hesitate to openly declare she was his mentor and guru. He took her along with him on all his pilgrimages. He consulted Amma on every matter, domestic or otherwise and found her guidance extremely rewarding. He understood that Amma was an Upasaka of Sri Chakkra and started addressing her Sri Chakkarathamma (Mother of Sri Chakra). It soon became ‘Sakkarai Amma’ in people’s language meaning Sugar (Sweet) Mother, more apt to the characteristics of Amma! This prompted Dr. Rao also to refer her as Sakkarai Amma! When Sakkarai Amma revealed that she would give up her physical frame soon, Dr Rao did not take it seriously. How can you go away from us, he would react. When she actually discarded her mortal remains in February 1901, it was a rude shock to him. However, he gathered strengths and arranged a big procession to carry the mortal remains to the place he had already bought in Thiruvanmiyur at the instance of Amma earlier, and advising him to bury her remains at the spot on her demise. Dr Rao built a temple on the site where Sri Sakkarai Amma was laid to rest and made arrangements for the upkeep of it. He founded a trust for the upkeep of the temple. Leading a hectic life, Dr. Rao developed high blood pressure and other ailments. Overlooking his health and personal care, he continued to engage in several public causes besides attending his patients and taking part in spiritual activities. Suffering a stroke due to high blood pressure, he expired on January 04, 1921. He was just 59 when the end came. The curtain dropped on the action-filled life of Dr. M.C. Nanjunda Rao, ensuring permanent rest for an illustrious soul that was always engaged in some public cause, and in an attempt to imbibe spirituality among people for a peaceful and contented life spreading harmony and love. No doubt, Dr Rao’s soul would have rested finally at the lotus feet of his Guru Shri Sakkarai Amma. As Dr. Rao was totally drawn toward his Guru Shri Sakkarai Amma physically and mentally, and likewise, the Guru Shri Amma was very fond of her prime disciple Dr. Rao, his mortal remains were also laid to rest inside the temple premises in a separate enclosure near Shri Amma’s abode; a bust size statue of Dr. Rao was installed later on at the site where he was laid.